A typical Little River Jetty Red. We visit multiple areas during your private fishing charter – mix and match our various trips to your liking! One of our favorite fishing spots in the famous Little River Jetties — located at the mouth of the ocean. The Jetties are a long rock pathway build by the US Army Corps Of Engineers to guide ships into the Little River area. The Jetties are between the Little River/North Myrtle Beach area and the border of Sunset Beach/Bird Island. This area is full of every type of saltwater inshore species and often in larger sizes as well. Targeted species include: Flounder, Bull Redfish, Black Drum, Sea Trout, Tautog, Tripletail, Black Sea Bass and Sharks. In particular, the Little River Jetties are famous for catching large Redfish that can exceed 40″ and over 35 lbs. A true “bull”! Our fishing strategy will focus on catching fish near the structure of the rocks with shrimp, mullet or soft plastics. Typically we prefer to rig shrimp on a weighted jighead and drift the bait into the face of the southernmost Jetty wall. The Jetties will provide you and your family a chance to catch dozens of fish during our charter and keep some for dinner as well. 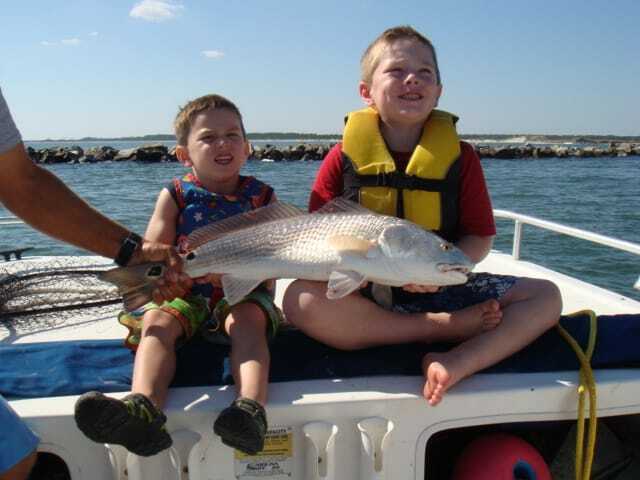 Let us take your family on a Myrtle Beach fishing charter in the Little River Jetties — we would welcome you aboard! Contact us today to book your charter.